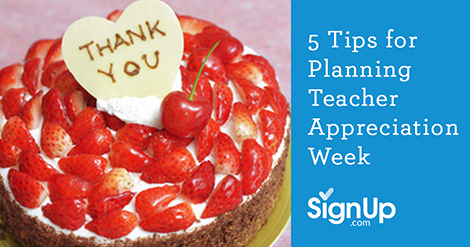 If Teacher Appreciation Week snuck up on you and you’re scrambling to get ready, these 5 last-minute tips will help. 1. Involve as many people as possible. Remember that if you’re overwhelmed with details, you are not the only one! Reach out to the other class parents who are similarly pressed for time. Use SignUp.com to organize and delegate details, giving everyone a small task instead of tackling the entire project on your own. Invite class parents to sign up from their computers or mobile devices, and rely on SignUp.com to send reminders. If everyone takes care of one small detail, your teachers will feel the love! 2. When in doubt, gift cards are your friends! If you’re not sure which gift cards to buy, remember that gift cards to local grocery stores, or online mass retailers like Amazon.com, are always welcome. Dress up your card in a felt wrapper, or enclose in a hand-written thank you card. If you’ve taken up a collection from the class to buy the gift card, have each student bring in a flower and attach the card to the bouquet. 3. Prepare for emergencies. Have a few extra gift cards, or thank you cards on hand just in case you run into an aide, substitute, special instruction teacher or staff member that didn’t make it on the main appreciation list. It’s also helpful to keep a bag with extra napkins, wet wipes, tape, cutlery, plastic wrap, ribbon and a knife or scissors stashed in your car just in case teacher appreciation events like lunches or lounge treats need some last-minute details. 4. Thank the parents who participate. Don’t forget to thank all of your class parents when the event is over! Send a quick email home to the class parents who participated, perhaps attaching a picture of the happy teacher! Let participants know their small contributions meant a lot. 5. Don’t forget to have fun! Teacher Appreciation Week happens every year and it can feel a bit like an obligation at times. Fun is contagious, though, and when your teachers feel your genuine appreciation for all they do, they will love any recognition you plan for them!